A site dedicated to the promotion and preservation of the art of prolific American abstract expressionist artist Vance A. Larson (1951-2010), and to the compilation of information related to his life and works. 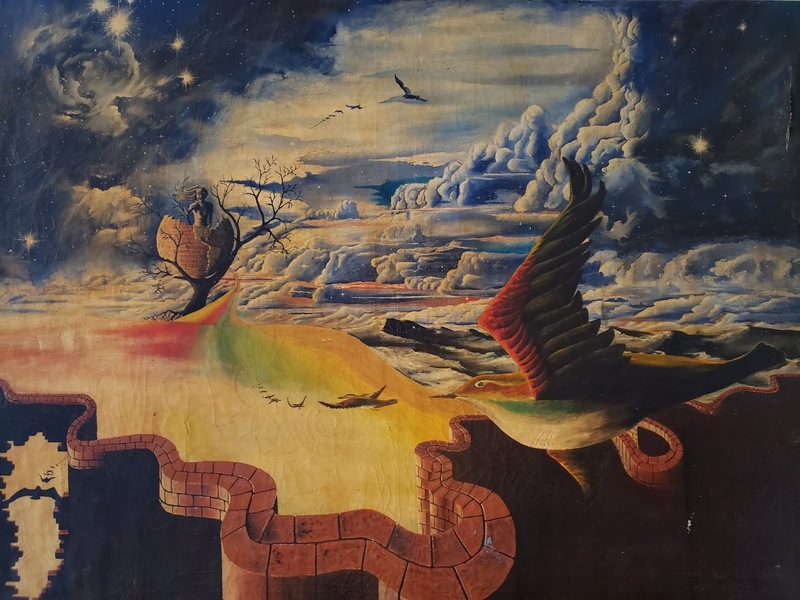 A magnificent and rare painting has been found: "Descendant of Adam", 72 X 54", is one of the earliest and largest paintings by Vance A. Larson, who at the time of composition (1970-73) was first at the Paier School of Art and then the Minneapolis College of Art and Design. At that time he signed his paintings "Eric Van Larson." This painting was recently acquired from the estate of a Russian diplomat in Washington DC, by Brendan Bahr of Alexandria, Virginia. The man in the Earth is a self portrait of Vance. Announcement: Due to an illness in the family we are currently not responding to queries about Vance's art. We hope to get back to updating this site in 2018. "Whose Wings" or "Living Dream"
This pastel, possibly originally entitled "Living Dream," was later titled "Whose Wings." It is a 40 X 60 pastel on museum rag board. We are interested in learning the whereabouts of the original painting. "Mystery" is one of Vance's early and rare representational hard-edge paintings from the 1970s. Further details, such as its dimension, medium and current whereabouts are unknown. Seeking Museum Placement for "The Lifestar"
We are seeking placement of the Vance A. Larson work, "The Lifestar," in a major museum collection. Interested curators may contact Valerie Haynes, sister of the artist, at Tel: 607-783-4045. The painting can be viewed in Gilbertsville, NY. "The Lifestar," a 40 X 50 original oil, was painted by Larson over the course of a year, from 1979 to 1980. He considered it to be his most important work, and is the culmination of his early, hard-edge period. It shows his spiritual nature like no other painting, the rainbow of ancient shamanic tradition. "The Lifestar" has been published as prints, and on the cover of the premier (2000) issue of Illume--Journal of Universal Ideas. This portrait of Maj. Gen. Fred Haynes, USMC, the artist's brother-in-law, is now in the permanent collection of the National Museum of the Marine Corps. A pastel, it is one of two portraits Larson painted of Gen. Haynes when the artist was living in Old Town, Alexandria, Virginia, in 1979 and 1980. The other portrait was done in charcoal. HAYNES FRED E. HAYNES (Age 89) Fred E. Haynes, 89, a retired Marine Corps Major General, died March 25, 2010 in a New York City hospital. He was a veteran of the iconic battle of Iwo Jima in WWII and founder of the Iwo Jima Association of America. He served with the 28th Marine Regiment, 5th Marine Division on Iwo Jima - the same regiment that raised the now famous flag on Mt. Suribachi. The picture, taken by Joe Rosenthal during the heat of the battle, has become the world-wide symbol of Marine Corps heroism. General Haynes served his country for almost 40 years, including three wars. Just prior to his demise, he participated in the 65th Anniversary of Iwo Jima Reunion and Symposium at the National Museum of the Marine Corps at Quantico, Virginia. General Haynes served in Korea in 1954 as the Executive Officer, Second Battalion, lst Marine Regiment. In Vietnam, 1966-67, he served as both Commanding Officer, 5th Marine Regiment, and as Chief of Staff, Task Force X-Ray, lst Marine Division. As a general officer he served as Legislative Assistant to the Commandant of the Marine Corps and subsequently commanded both the 2d and 3d Marine Divisions. With extensive experience handling prisoners of war, General Haynes also advised presidential candidates, as well as sitting presidents, on the treatment of those captured during battle. He strongly advocated humane treatment of all prisoners, not only because he believed "it was the moral thing to do", but also because humane treatment often provided valuable intelligence at a time when the lives of servicemen and women depended on it. General Haynes, along with co-author James A. Warren, wrote the best-selling military book on WWII, "The Lions of Iwo Jima". It is a firsthand account of the 4,500 Marines, from Combat Team 28, 5th Marine Division, during the ferocious battle for Iwo Jima in 1945, in which the General actively participated. This highly decorated Marine Corps General is survived by his wife Bonnie Arnold Haynes, three children Karen Francis Haynes, Fred Elmore Haynes, William Lane Haynes and stepdaughter Alexandra Samantha Tramont. Services to be held at a later date. Among my dearest memories of Vance were when he lived in Olde Town, Alexandria in 1979 and 1980. This self-portrait was from that period. When I visited him there he was often playing chess with Bill Paren, a collector of his art, and listening to Tomita's Debussy. Gold Note was painted in 1981, and is one of Vance's early pastels. It shows his transition from the hard edges depicted in his early oils to the softer lines of his later pastels. We are interested in learning the whereabouts of the original painting. "Stairway to Another Dimension" is a pastel painting from Vance's California period. We are interested in learning the whereabouts of the original work. We are pleased to announce the launching of Catch Your Dreams Like Thunder, a companion blog to this one, dedicated to collecting biographical materials on the life of Vance A. Larson. We welcome, and are grateful for, your input. The print of Kokopelli Gold is available from several independent sources on the Internet, and is one of Vance's more famous works. We are interested in learning the whereabouts of the original pastel. Painted in 1980, and purchased by Major General Fred and Mrs. Valerie Haynes, while Vance was in Washington, DC. In 1990 Valerie Haynes gave the painting to Cynthia and Athena Samuel. Giclee prints of Blue Note are offered for sale by Art Encounter of Las Vegas. Welcome to all Friends and Devotees of Vance A. Larson and his art. 3.) To Promote Vance's Art with art shows, museum collections, and other venues. The family of Vance A. Larson is also in the early stages of establishing a Vance A. Larson Gallery. For further information about this, please contact Prof. James Nelson, jnelson@ad.nmsu.edu. I am Vance's twin sister, and can be reached as follows: Valerie Haynes, PO Box 86, Gilbertsville, NY 13776. Tel: 607-783-4045. valeriehaynes@live.com. Thank you...We look forward to hearing from you and getting your input.